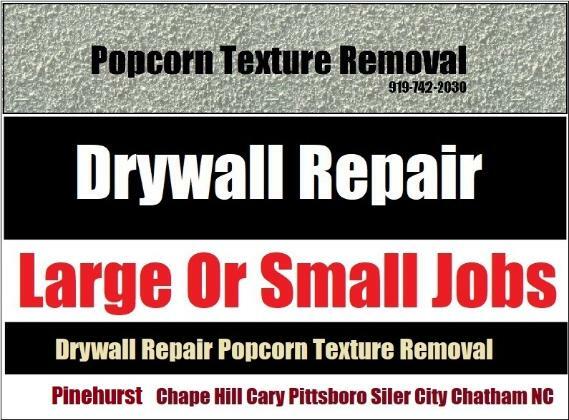 If your home in Pittsboro has popcorn texture and you would like to have it removed call Drywall Specialist a leading local contractor for fast, professional popcorn texture removal work in Pittsboro, NC. Providing service locally in Chatham County for over 27 years. Leading Local Popcorn Texture Removal - Affordable Prices Free Estimats And Quotes On Lg, Small Jobs In Pittsboro NC And Nearby Areas! Drywall Specialist: Copyright 2017 All Rights Reserved 919-742-2030 Local Popcorn Texture Removal Pittsboro NC.